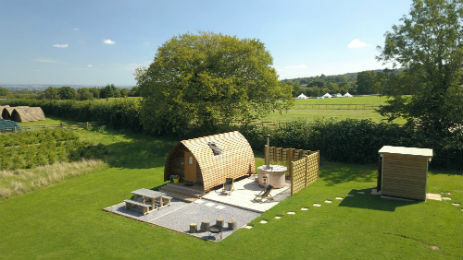 Enjoy a glamping weekend/week day away with your family and friends in the beautiful countryside of Somerset. Located in an area of outstanding natural beauty Secret Valley is found nestled in the foothills of the Quantocks. The accommodation is thoughtfully spread out on the farm, providing either a more intimate or collective environment. Groups can slumber together in the large yurt or spread out in separate wigwams or lodges. There is also the option of staying in yurts, tipis or our new deluxe wigwams and shepherds huts with wood fired hot tubs (perfect for romantic break with your partner!). There is plenty of space for organising games or activities around the accommodation, with fire pits to barbecue on and keep you all warm as you watch the sunset over the rolling hills and star gaze into the night. Or you could cook up a feast in the Owl barn kitchen with all utensils provided and enjoy dining together around the large table! Everything is provided to make your stay as comfortable as possible with hot showers, flushing toilets and WiFi.